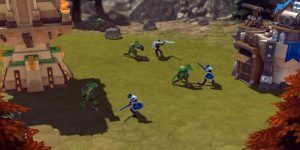 Siegecraft Commander is a neat little RTS that blends tower defense, turn based strategy and traditional RTS systems that are easy to use and understand whether you are a strategy veteran, or if this is your first time with the genre. At first glance this medieval inspired cartoon world seemed like it would be filled with factions of creatures and humans alike but in reality there are only two races of playable characters. There are the humans, which are broken down between the Peons and the Knights, and the Lizard men, which are separated into a warrior class and a sorcerer class with nothing really special about either one. Although it does not take long to learn the mechanics of the game, I found that once you get started there isn’t anything really compelling about the game or the factions you are playing with and against. For starters you can chose between two different campaigns. The Knight campaign where you battle the Lizard men, or the Lizard men where you battle more Lizard men. The game is bright and colorful, but there isn’t much of a distinction between the characters other than the humans are blue and the Lizard men are orange, but when you play against other Lizard men you can’t really tell which of the infantry are yours. The environments do not really offer much to look at either. Overall bland settings with small changes in size and scope. Mechanically the game is actually pretty strong. As one who doesn’t normally play strategy games this one was very easy to start and understand. As each level or match begins you have your starting structure called your keep. From there you can build either an outpost, a garrison, a library or in the case of the Lizard men similar structures just with different names. Ultimately you will find yourself building outpost after outpost because Siegecraft does something I think is pretty unique (or at least I have never seen it before) where the game has you launch a cannonball that spawns your structure if and when it lands on a flat surface. As you erect your outpost a wall instantly raises up connecting you to your structure making your Keep the heart of what will almost become a hive. In fact everything you build stays connected to the structure you launch it from. This makes expanding somewhat difficult because you are limited on where you can build by whether or not the land is suitable. Once you start growing your outposts if you double back and try to build off of an old outpost you may or may not have room leading to the player having to think about where and how they want to progress so they have the space to do so. 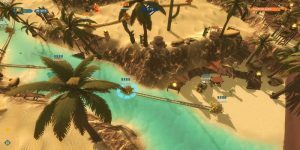 Once you are in battle things get a little tricky because if the enemy destroys an outpost that you have built multiple structures off they will all explode! This forces the player to be more strategic on how he or she builds, where he or she builds, and where the player attacks from. As I progressed through the game and built new structures, fired off new weapons and progressed through the campaigns I found that the controls left me down the farther I went. This game would greatly benefit from using a mouse and keyboard rather than the Dual shock 4, but since I reviewed the game on a console, I found that my frustration began to outweigh the fun factor. For example the feeling of progression would come to a screeching hault once enemy AI would begin to build their outposts and arsenal in almost spider mine like fashion and attack me from both sides. At times I felt outpaced almost two to one when it came to building up my forces against the AI. This continued to the point of me shutting down the game for extended breaks because I simply got tired of fumbling through the map and getting defeated while feeling like if I could just navigate a little faster this wouldn’t happen. Overall Siegecraft Commander falls flat even though it has some strong game mechanics. With an empty world, and baron story and a control system that feels a little sluggish this game doesn’t resonate with me as a player. Although I do believe there is something good here it failed to connect with me and keep me engaged. Playing against another player locally was much more fun in my opinion than either side of the two campaign options. PVP coupled with the option to move in real time or turn based was much more fun than battling the AI that felt faster and seemed as if it moved much more fluid than I could.